Annie Meub, right, manager of The Bitter End in Wells, sits with Chef Richard Ellis at the eatery using straws made from corn. If you go to The Bitter End on Route 1 in Wells and ask for a straw with your drink, you’ll get one — but not the plastic kind you’ve been sipping from for years. The eatery, which serves contemporary American food, offers straws made of biodegradable paper. Its cocktail straws are made from corn. 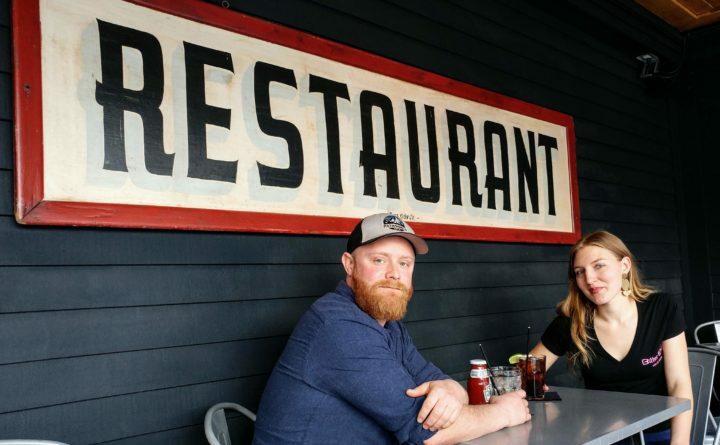 “They look and feel like plastic, but they’re 100-percent corn,” said Annie Mueb, the general manager of the restaurant, which is owned by Peter and Katie Morency. The Bitter End has been offering non-plastic straws – as well as other eco-friendly measures, such as cloth napkins and glasses of water only by request – since it opened at the end of last May, according to Meub. Pedro’s in Kennebunk, a sister restaurant to The Bitter End, also takes the same approach. “It’s a really easy fix, a small thing we can do to make an impact on the world,” Meub said. The Bitter End is one example of several local restaurants that the Planeteers of Southern Maine is applauding as part of its ongoing “Skip the Straw” campaign. Other eateries that are forgoing plastic straws include Batson River Tasting Room, The Boathouse, The Colony Hotel, Old Vines, the Spirit of Massachusetts, and Domino’s Pizza, according to Andrea Rothkimmich, a cofounder of the Planeteers. The Planeteers of Southern Maine is based in Kennebunk and serves that community, Kennebunkport, and Arundel but also extends its reach beyond those borders. The organization has a steering committee of seven members and others who are involved in such issues as beach erosion and debris monitoring and take part in environmental talks and organize local Earth Day celebrations. The Planeteers’ “Skip the Straw” efforts are in step with its overall “Choose to Refuse” campaign that it launched during its Earth Day celebration last year, according to Rothkimmich. The organization first started with a focus on eliminating local use of single-use water bottles and eventually set its sights on curbing the availability of plastic straws, as well. In a press release, the Planeteers said that the reason for their “Skip the Straw” campaign is clear. In addition to asking restaurants to refrain from offering straws, the organization also plans to advocate for the bulk pricing of alternatives to plastics and seek ways to establish easier means of composting. In an interview, Rothkimmich called straws a type of “gateway plastic.” She added that most straws are made of plastic that is not recyclable and that gum up the works at recycling facilities. Straws also are often among the litter that so easily can find their way into local water, Rothkimmich added. “We live in a community chock full of restaurants right on the ocean, and it takes only one gust of wind to blow that lightweight straw into it,” she said. The Planeteers started visiting local restaurants in October, reaching 30 at first, in the hope of persuading them to eliminate plastic straws from their stock. The group resumed its efforts with other restaurants in January and in the end hopes to reach all 101 establishments on its list, according to Rothkimmich. The Planeteers will issue a report with an exhibit at its Earth Day celebration at the Wells Reserve at Laudholm Farm on April 19. The report and exhibit will chart the success of the organization’s campaign and will highlight the “best practices” in the area. “Our success is entirely reliant on the extent to which the restaurateurs recognize plastics and, especially, straws, as a peril, and commit to changing it up,” Rothkimmich said. More than 75 percent of the establishments that the organization has approached so far have pledged to “Skip the Straw,” now through Earth Day, Rothkimmich added. What about those with disabilities who need straws? “I’m pretty sure those with disabilities (have their own straw) and would have it with them when going out to a restaurant,” Rothkimmich said. What if a patron does not trust that the glasses in which their drinks are served are clean? Rothkimmich said her advice to restaurant owners is not to hand out any straws — and, if necessary, instead have a lidded container with bamboo, metal, glass, hay, and paper straws to sell.